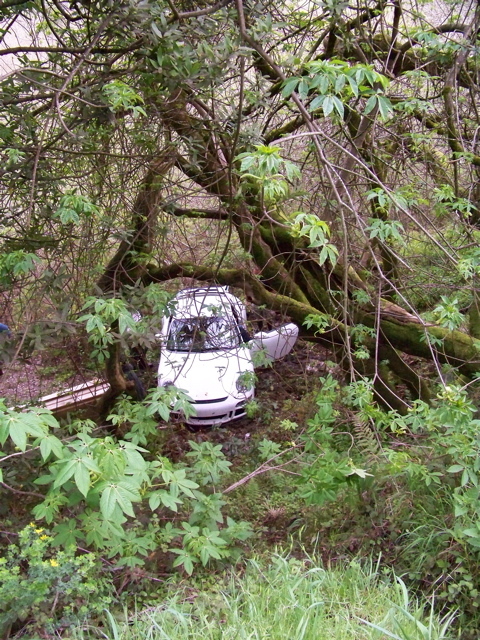 A sportscar went out of control on the Point Reyes-Petaluma Road immediately east of Highway 1 about 2:30 p.m. today, sailed off the roadway, and landed on its wheels 25 feet down an embankment. 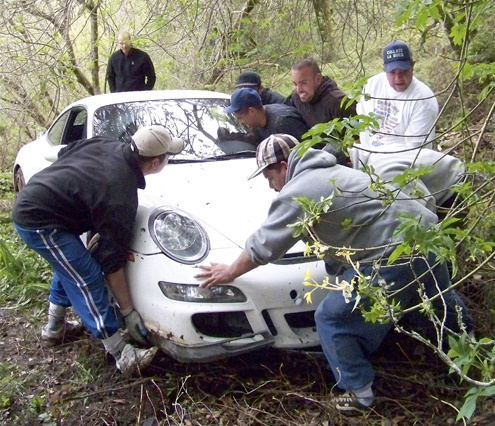 The white Porsche GT-3, which landed facing back toward the road, was airborne for roughly 50 feet, as evidenced by bare spots where bark had been knocked off limbs high above the ground. 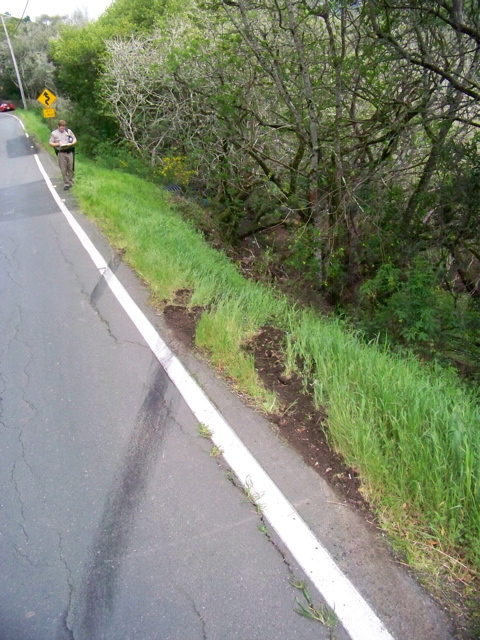 From skid marks on the pavement, it appears the driver lost control in rounding the first curve east of Point Reyes Station. He then over-corrected and ended up in the oncoming lane before spinning back across the road and off the embankment. 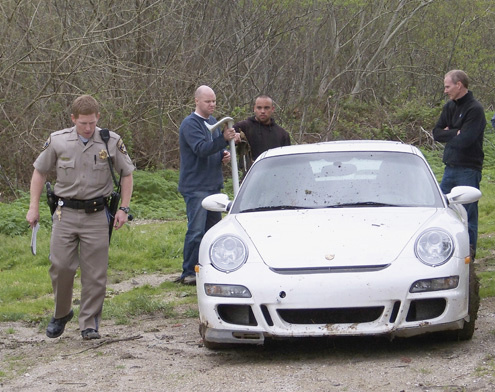 The property on which the Porsche landed is used by Tomales Bay Oyster Company, and its workers managed to turn the car around by sliding it on the muddy ground. The driver was able to start his car only to have its wheels spin in the mud. The oyster workers then pushed the car to open ground, from which it could be towed. A highway patrolman checks the car while the driver stashes its broken spoiler behind the seats. To aid the families of retired officers and those killed in the line of duty, the foundation raises its money from individual donors, volunteers, and grant-making institutions. 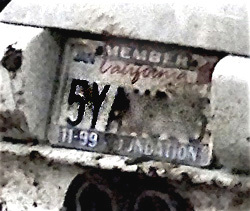 However, the “member” license-plate frames have occasionally come under fire as potentially having a corrupting effect. Critics in past years claimed that people who liked to drive fast made large donations in order to get the frames, a membership certificate, and a special wallet with a 11-99 Foundation badge to show any CHP officer who pulled them over. I find it curious that you elected to take a near tragic accident, with a miraculous and positive outcome, and weave it into a story about the 1199 foundation and the tired claims of alleged preferential treatment to its members. Could this be due to the dearth of information to explain the accident and the fact that there was determined to be no wrong-doing by the driver? Journalistically, your “report” is a disappointment. Before the Highway Patrol made public its report on the accident, writer John Paris apparently knew what it said. The CHP’s Public Affairs Office is not open on the weekend, and the wreck has not yet received other news coverage. Just now The West Marin Citizen told me that a few minutes ago CHP public affairs officer Chris Rardin reported that the accident has been attributed to an “unsafe turning movement.” However, the driver, whom the CHP identified as Joshua Moore, 38, of San Rafael, has not been cited. Whether the “unsafe turning movement” was caused by speed, by a distraction, by the driver dodging an obstacle, or by something else is not clear. Not only was the driver’s safe landing miraculous, it was also miraculous that no oncoming motorist was struck when the Porsche swerved into the westbound lane. As the posting noted, the only thing I initially knew about the driver’s identity was his license-plate frame that says “Member 11-99 Foundation.” Having never heard of the group before, I checked online and reported what the group says about itself. I also found that foundation directors are concerned that the frames could be acquired by drivers hoping to “inappropriately influence” an officer. As a result, the foundation last year stopped issuing frames to donors and is trying to get control over frames already in circulation — in part by threatening legal action against eBay, Craigslist, and others who sell them online. Such sales are illegal, the foundation says, because it owns the frames. Rather than being a tired, old story about 11-99 Foundation license-plate frames, such as the one on the Porsche, this sidelight was new information to me and, I suspect, most readers of the posting. That being said, I agree with writer Paris that if the outcome of the accident had been tragic, it would have changed which topics were covered in the posting. Actually, I hadn’t heard about the 11-99 license-plate scam — so this is all new information to me, and not “tired” at all. The relevance here, to me, is that people who feel that they’ve bought some kind of immunity to traffic citations would logically seem to be more likely to indulge in extremely risky driving behavior. Such as racing their tricked-out Porsche around tight corners on the PCH, trying to outpace another nitwit in a Ferrari. If you felt compelled to drum up a story because you knew nothing about the driver or the accident, perhaps some penning about “sharing the road” with bicyclists who insist on riding two or three abreast as potentially being the cause of what appears to be an unexplainable accident might have been of more value here. As an 11-99 member and a family member of a California Highway Patrol officer, I am offended at your efforts to apparently inform the public that 11-99 Foundation is of a corrupt nature. The sad implication here is that a driver displaying the 11-99 license plate frame is looking for a break from law enforcement; therefore, conversely you are implying that officers do in fact give such members a break. This simply is not the case. The 11-99 Foundation is highly respected and needed in the CHP organization, and, in my opinion, trying to attach a negative element to it is self-serving and careless on your part. Perhaps you could have balanced you scoop here with stories about how much the Foundation has helped CHP family members who have lost their loved-ones in the line of duty. One bad apple CAN spoil the whole bunch, so please be more careful with the information you put out there to inform the general public. Balance what you offer, then we can decide for ourselves. So disappointed you chose to do a 11-99 scam word play… how shallow and disappointing. Those plates were for a very wonderful cause and ruined by a few unworthy of the responsibility. But hardly even near your coice of irresponsible word play. May be you might want to contribute to the Officer Down Fund as soon as you can gather a remorseful moment. 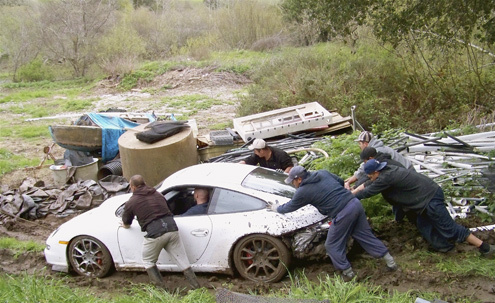 Dave LaFountaine might like to know from his insightful post that both cars were going 35mph and a flat tire caused the rear end of the Porsche to slide to the right side of a muddy shoulder….grabbing the car and flipping it down off the road. The same could have happened to your PC Prius at the same speed…but you would have had battery acid all over you and would have had to be cut out of your environmentally caustic tin death trap instead of walking away. Richard may know something about the cause of the Porsche flying off the road that the rest of us — including the Highway Patrol — don’t. However, I’m a bit skeptical about parts of his comment. I don’t doubt that a car that dropped 25 feet and landed on its wheels would have some air knocked out of its tires. However, as photos confirm, none of the Porsche’s tires was deflated. As for speed, how many people really believe the sportscar was poking along at 35 mph in a 55 mph zone and yet somehow had the momentum to fly 50 feet horizontally when it left the roadway despite banging into tree branches? And for the record, the posting in no way denigrated the 11-99 Foundation. The information about people trying to misuse the “Member 11-99 Foundation” license-plate frames to “inappropriately influence” officers came from an announcement the foundation itself put online http://www.chp11-99.org/news/news_show.htm?doc_id=705141. The announcement says that stopping this abuse is an “urgent matter.” I’m surprised by Richard’s indifference to the foundation’s concerns. In defense of being 11-99 member, just because they have a faster car than you doesn’t make them bad. As a member, it doesn’t buy influence, nor is it intended to do so. From the tone of your incomplete “report”, it appears you wanted to be able to pat yourself on the back for being the 3nd to know about a ticket issued in your backwoods. Bummer, man, as it didn’t happen, your story instead had to turn to conjecture. As an amateur Porsche racer, I’ve spun my Porsche at speeds under 50 miles per hour on the track due to a failed tire. Did the highway patrol look at the insides of the wheels? As a reporter you should have done a story on the car. it has a differential (look it up) that causes the other tire that has grip to increase its grip. IF he had a flat rear tire, the tire with air is going to grab the car which is going to put it into the ditch. Next time do a story on the marvels of modern engineering. The guy got lucky and appeared to have walked away from it. By the way, do you get any date requests from your mugshot? I neglected to add, a spinning car with all its weight in the back will transfer its weight around like a pendulum, and without the friction of the 4 tires keeping it planted, isn’t going to slow down as the tail end whips around. I did some rough calculations and for a car to travel 50 feet while dropping 25, it would have been traveling less than 40 mph. I’m not an accident investigator, but if he had been traveling faster, there would have been more damage to the vehicle. From the pictures, it didn’t appear there was a substantial amount of kinetic energy. you are implying that officers do in fact give such members a break. As for the explanation that a flat tire caused a spin-out … sorry, but that just doesn’t hold water, because the physical evidence at the scene just doesn’t support it. The car was airborne when it left the road. I’ve put a few cars into country ditches over the years, some of them on icy roads where I’ve been spinning. Once on an interstate when I hit a patch of black ice, and I was doing about 60. Even at that speed, never did I catch air so that I soared through the tops of trees on the side of the road. Mostly, I just slid down the side of the ditch. do a story on the marvels of modern engineering If you want to read stories about modern marvels, there’s an entire TV show devoted to that. Have fun over there; enjoy the target demographic-appropriate ShamWow and DeVry Institute ads. 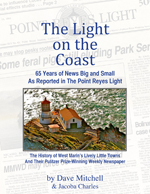 This site is devoted to reporting the news and events around West Marin. Which this story indisputably was. would have had battery acid all over you Um, no. I don’t drive a Prius, (used to drive the Honda Civic Hybrid, though) but even if I did, I know enough to know that the batteries that drive the electric drivetrain are not like standard lead-cell car batteries. They are either NiMH or Lithium-ion batteries, much like the ones in your laptop or digital camera. Much more expensive and harder to manufacture … and try to think of the last time you’ve had to check the water levels in your laptop battery. Actually, I rather encourage you to attempt to service your laptop battery by pouring water into your laptop. any date requests from your mugshot? I’m not sure if that’s meant to be nasty or not. But I hope the pic does bring in a mash note or two, seeing as how it was shot on my porch. Sparsely Sage and Timely is powered by	WordPress 4.9.10 and delivered to you in 0.931 seconds using 57 queries.